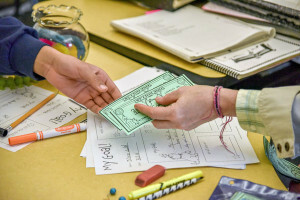 The Harvard Business School Association of Oregon chose The Shadow Project as the beneficiary of its Community Partners Program because its unique partnership with special education teachers has produced a program that is impactful, scalable and cost-effective—meaning it has the long-term potential to foster success for Oregon’s vulnerable students statewide. More than 75,000 Oregon students—13% of the state’s school-age population receive special education services. These students are bright and capable, but only half of them graduate with their class. They have the lowest on-time graduation rate in the state. The Project Team conducted dozens of interviews with stakeholders in the nonprofit community, education and state government. The Team used three methodologies to calculate Social ROI to quantify the benefits and costs of the program to society and students, using metrics that impact high school graduation as well as longitudinal studies on success attributes for children with disabilities. All three methods showed extremely high ROI, with Benefit/Cost ratios of at least 26 to 1. That means investing $1 in The Shadow Project produces at least $26 in returns to both the state and students. Based on teacher reports, the team found that children who participate in Shadow are becoming engaged learners who develop critical attributes such as perseverance, self-awareness and goal-setting. Portland Public Schools. Shadow is one of six nonprofits selected by the district for its collective impact project to support third grade reading at high needs schools. Early Literacy Success Alliance. ELSA is an advocacy coalition dedicated to providing at-risk children with a strong foundation of literacy. All Hands Raised. As part of the Youth, Empowerment, Motivation & Development group, Shadow puts cutting-edge growth mindset research to use in the classroom. Learning Ally. On the national level Shadow collaborates with the world’s largest supplier of audio textbooks for children with disabilities.